ABOUT US is really “about me”, as there is just one of me, and this is my site. So, what brings me to write this? In life, many things seem to conspire. I have a great love of practical things, and quality thrills me. Hydrogen peroxide is both practical and quality. I have the urge to pass on to others that which pleases me, whether it is mundane and practical, or elegant and philosophical. Accomplishing more with less is funny, and life always needs humor. I love being involved with the cycle of life. Using things that break down is satisfying. Composting is satisfying. Gardening is satisfying. Using peroxide in my bath, and then running the water out to the garden is satisfying. Knowing that this simple substance brings life to the garden as well as cleaning my cuts, and cleaning my floor, is funny and satisfying. Thinking about the hydrogen peroxide in rain water, falling to the earth, and cleaning the air…. is satisfying. I like things that I can understand and apply. Simple stuff. Using hydrogen peroxide results in less chemicals, in an immediate, personal way, in my daily life. Simple. Also less toxicity from germs and mold. Less stress on the body from chemicals. Less stress on the body from pathogens. Sounds good to me. Those are some of the things that have kept me interested in H2O2 over the years. About 10 years ago, someone I knew only from a list told me about “oxygen therapy”. (This refers mostly to using peroxide and ozone for health. It can also include hyperbaric oxygen therapy, and some other forms of oxygen.) I’d never heard of that. So, I read some books about it. It all sounded entirely weird for quite some time. Hydrogen peroxide sounds so “chemically”, and so does ozone. It took a long time to see any connection to oxygen, and how that was connected to “therapy” or body care or anything else. But eventually I did start to see how both oxidation and oxygenation connect up with hydrogen peroxide (as well as ozone). I kept being interested and curious, and I kept reading. Over time I started to experiment, mostly with taking hydrogen peroxide baths (which I’ve done off and on for years now). Most of my use of H2O2 feels like an experiment to me. I try things out, to see if I like them. There are some other things I’ve used hydrogen peroxide for, over less time, or less consistently…. I mix it into my hand soap recently, and dish soap too…. I do use it in very very dilute form, mixed with LOTS of water as an oxygen supplement, but I really don’t do this consistently or often. I have also put very tiny amounts of hydrogen peroxide into the drinking water for cats, but, again, I have not done this that consistently or often. I order 35% food grade hydrogen peroxide 15 gallons at a time. (Initially, I started with smaller amounts.) Fifteen gallons of 35% lasts me about a year, give or take. It arrives by truck. I pump it out of the 15-gallon-plastic-tank and into a gallon plastic bottle (marked with danger labels.) I use the concentrated form, 35%, only for adding to the bath, or to put in the sprayer that I use to water the garden. In other words, I only use 35% in applications where it is hugely diluted with large amounts of water. For everything else, I use 3%, which I mix, a gallon at a time, and keep in the kitchen. There are also smaller containers of 3% in the kitchen and in the bathroom, and there is a spray bottle of 3% in the bathroom and another in the kitchen. 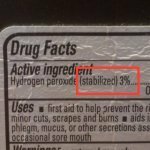 to neither overstate nor understate the usefulness of hydrogen peroxide – this should be very tough -- it's good for a lot. to cover the bad along with the good and the vague along with the exacting. to neither understate nor overstate what I know about the topics on the site, while including my excitement about the topics. to give practical information that can be directly applied, as well as covering more heady topics. to discuss a wide range of topics and uses – such as the many home uses of H2O2, the legal status of using it in medicine, the environmental use and creation of H202, and commercial and industrial uses. My hope is that the website will benefit others, in a direct way that is useful.